The new Marabu Porcelain & Glas Painters! Marabu presents the relaunch of the new Marabu Porcelain & Glas Painters just in time for Creativeworld 2017. 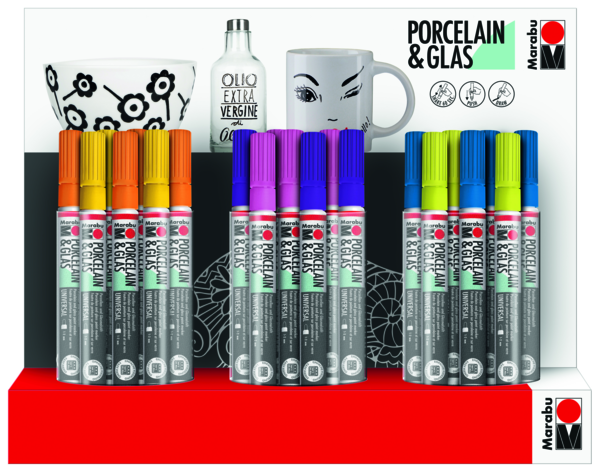 The new look porcelain and glass paint marker scores points with optimised quality, an enhanced choice of colours and tips and new assortments and trendy sets. 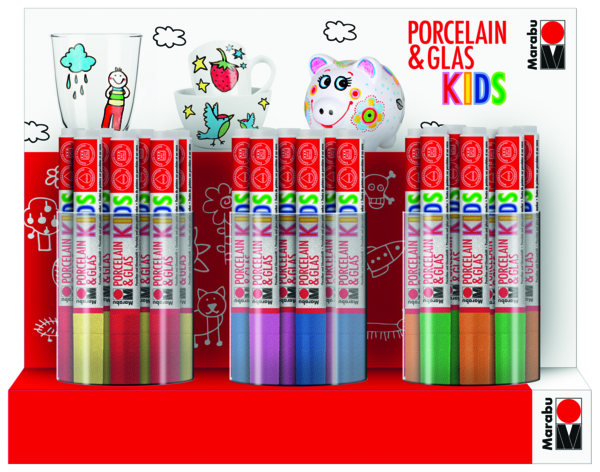 The Porcelain & Glass Painter KIDS has also been optimised and relaunched in this way. Both are now even more user-friendly and open up even more creative possibilities. Simply more! More choice of colours, more tips, more quality. More possibilities. More fun! 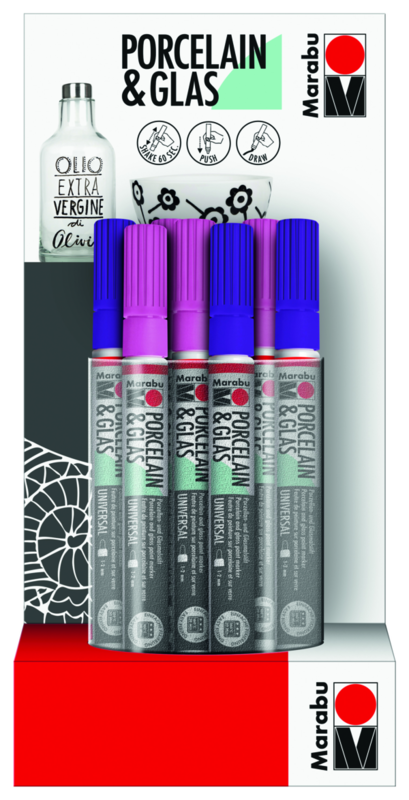 The new Porcelain & Glas Painters with a pump system inspire with a choice of 33 highly pigmented colours and 4 different tips. A further development of the ink formulation in our own laboratory enables the new Painters to work on porcelain and glass and many other surfaces. One for all! The applied paint is rich and the colour spectrum ranges from brightly coloured to ultra soft. 10 metallic and 7 glitter paints create very special effects. The Painters with the new formulation are ideal for use on porcelain and glass, but also on metal, mirrors, ceramic, terracotta and stone. The paint is more transparent on glass than on porcelain. The decorated objects become dishwasher-safe by simply fixing them in an oven. UNIVERSAL 0.8 mm metal-enclosed plastic tip: the unique tip enables clean outlines and lettering. 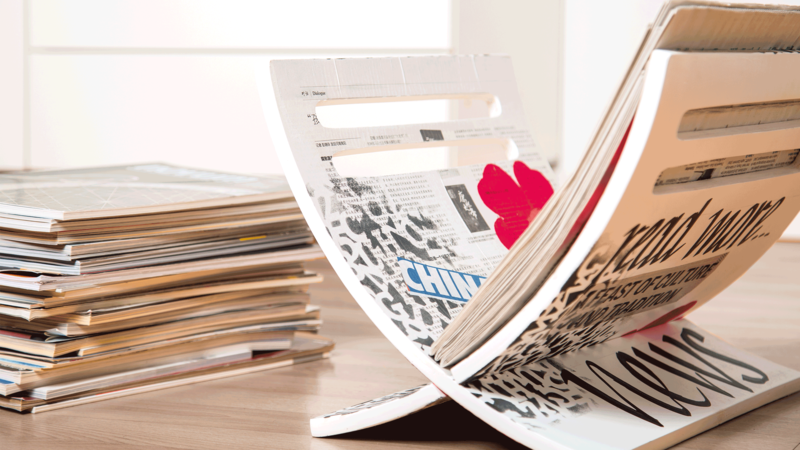 It is ideal for delicate painting and writing and perfect in combination with stencils. UNIVERSAL 1-2 mm: this tip is ideal for painting and writing, making it ideal to use for a variety of techniques. UNIVERSAL 2-4 mm: the 2-4 mm tip with a brush-like feel is perfect for filling in large surfaces. CALLIGRAPHY 1-2.5 mm: the calligraphy tip is ideal for writing names, messages and signatures. Two assortments “Elegance” and “Seaside” (sets of 3) as well as three assortments “Basic”, “Fantasy” and “Summer” (sets of 5) combine harmonising colours in attractively designed themed packages in a user-friendly way, thus providing assistance with the choice of colours. The “Winter Star” set turns a simple mug into a colourful drinking vessel. A heart-warning message or a nice winter scene on the mug are a highlight on your own breakfast table or turn the mug into a great individual gift in the cold winter months. The “Love & Kisses” set turns a simple drinking vessel into a lovely morning greeting. Whether you add a cheerful message for your nearest and dearest, or a great design; whether for your own mug and cup collection, or as a little gift – everything tastes so much better from a lovingly decorated mug! The Porcelain & Glas Painter KIDS has also been enhanced. 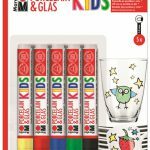 The extra thick paint marker with the new, robust round tip and simple filter system enables children aged 3 and over to paint bright colourful artwork on mugs, glasses, plates and many other items. It naturally complies with the standard for toy safety EN 71-3. 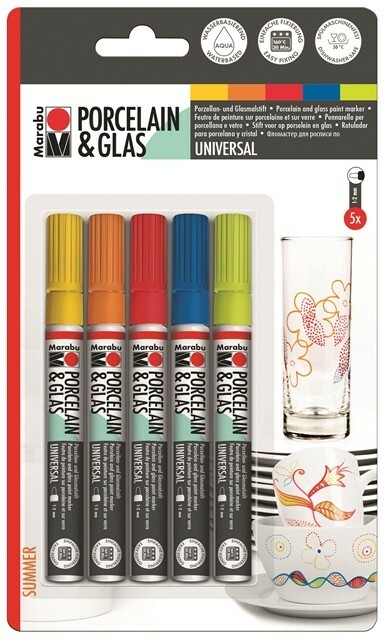 The handy markers in 13 vivid colours create great designs on porcelain and glass. 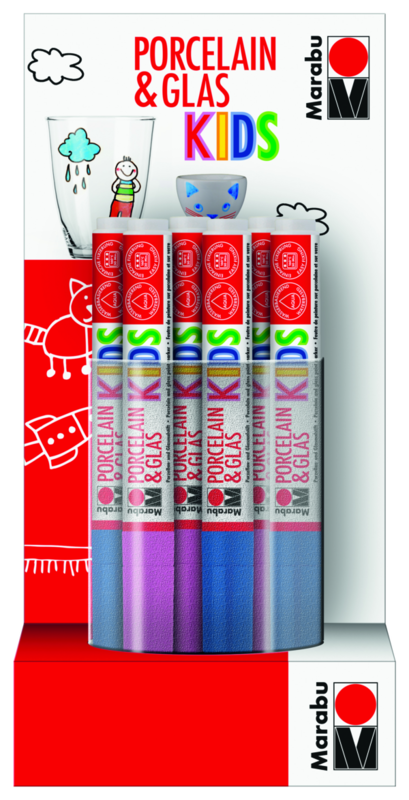 The marker is extra thick with a good grip and is therefore perfect for little hands. The filter system with improved technology is easy to use and the robust, child-friendly round tip now withstands even more pressure – a guarantee for great long-lasting paint application. 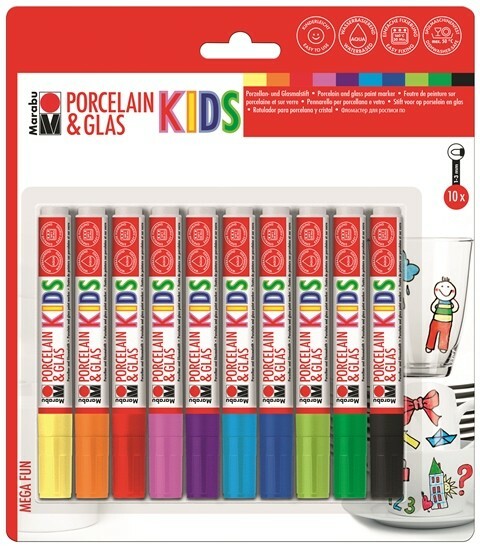 Children can use the marker on porcelain, glass, metal, mirrors, ceramic, terracotta or stone. The artwork is dishwasher-safe up to 50°C after fixing. 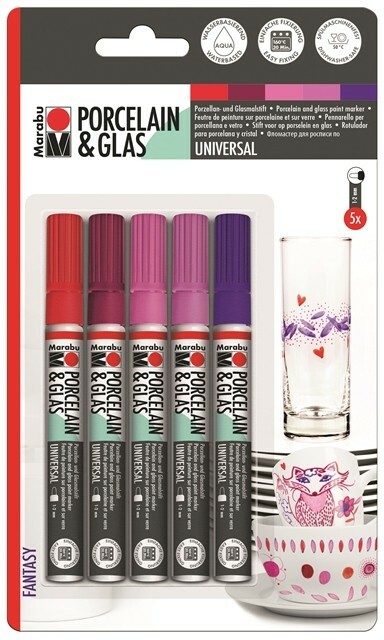 Children can paint mugs, glasses, piggy banks and many other items easily and in a fun way with the new FUN, MAXI FUN AND MEGA FUN assortments (sets of 3, 5 or 10). The Morning Friends set allows children to decorate amazing egg cups quickly and easily. Whether you add funny faces, the names of your family, or patterns; whether you use it for the breakfast table at home or as a little gift – your soft-boiled egg tastes twice as good from a self-painted egg Cup!